6 August 2014 – One year ago today ESA’s Rosetta spacecraft rendezvoused with comet 67P/Churyumov–Gerasimenko out between the orbits of Mars and Jupiter, over 400 million kilometres from Earth. As the comet’s gravity is so minimal – if you were standing on 67P’s surface you could easily throw a ball upwards faster than its escape velocity, IE it would never come back down again! – Rosetta couldn’t just insert into a normal elliptical orbit, but instead had to perform a series of triangular-shaped orbits, making periodic engine burns to gradually work its way down to an orbital height of around 30 kilometres a month later. 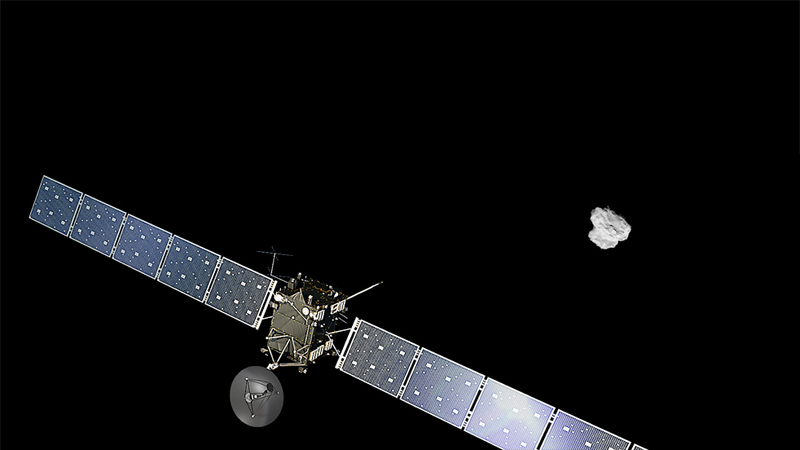 Artist impression of ESA’s Rosetta approaching comet 67P/Churyumov-Gerasimenko. The comet image was taken on 2 August 2014 by the spacecraft’s navigation camera at a distance of about 500 km. The spacecraft and comet are not to scale. Hello and welcome to Beyond Earth Orbit – a blog devoted to space exploration in the Solar System and beyond. It’s an exciting time in space exploration, with NASA’s New Horizons probe due to give us our first ever close-up look at the dwarf planet Pluto in July 2015. The European Space Agency’s Rosetta orbiter and Philae lander are travelling with comet 67p/Churyumov–Gerasimenko as it closes on its closest approach to the Sun in August. The Mars Science Laboratory, also known as the Curiosity rover, meanwhile, continues to make amazing discoveries in Gale Crater on the red planet. This blog will bring you news and pictures of these missions as they break.